Slope is one of the the most important topics in algebra and is often understood by students at a superficial level. I suggest introducing slope first by drawing upon prior knowledge and making the concept relevant (see photo above). This includes presenting the topic using multiple representations: the original real life situation, rates (see photo above) and tables, visuals, and hands on cutouts (see photos below). A key aspect of slope is that it represents a relationship between 2 variables. Color coding (red for hours, green for pay) can be used to highlight the 2 variables and how they interact – see photo above and below. The photo below can be used either in initial instruction, especially for co-taught classes, or as an intervention for students who needs a more concrete representation of a rate (CRA). The clocks (representing hours) and bills can be left in the table for or cut out. In special education there is a tool called a task analysis. It is a formal approach of identifying the steps taken to demonstrate mastery of a skill. For example, putting on shoes with Velcro straps involves the following steps: get shoes, sit on chair, match shoes with feet (right to right), insert foot into respective shoe etc. I have applied this approach to general curriculum math topics from counting money to solving using the Quadratic Formula. 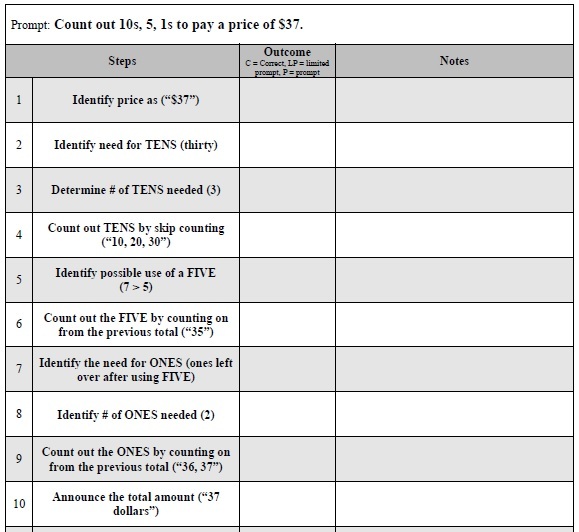 Below are the iterations of my task analysis for the objective count TENs, a FIVE and ONES (dollar bills) to pay a given price. The first shows a rough draft of notes I took as I actually counted out the money, going through each little step. 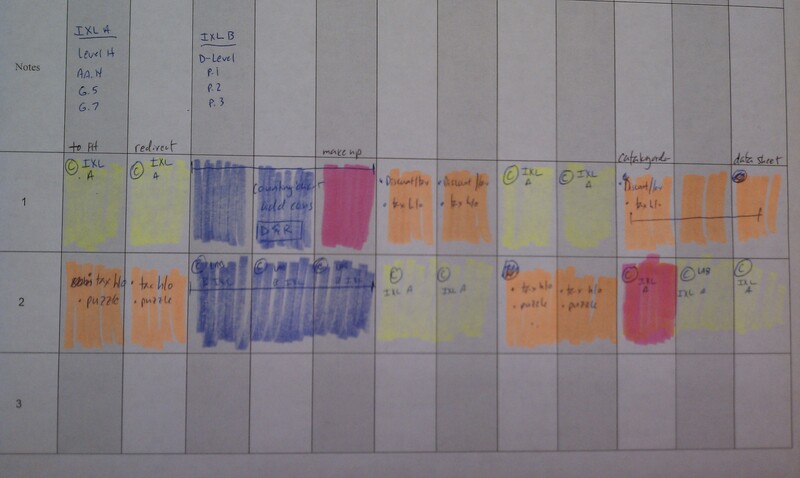 The second shows the steps written out on a task analysis table I created. The third shows the final, typed version. The table is used for assessment, collection of data and progress monitoring. The steps that are problematic can be targeted individually, e.g. 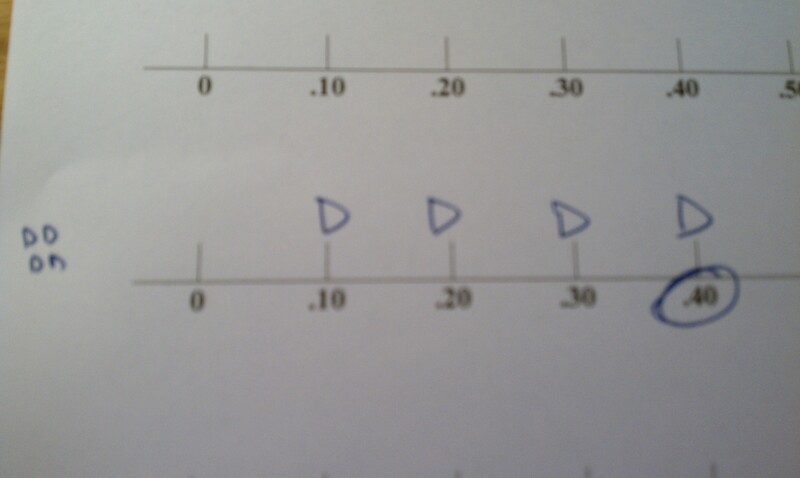 skip counting by 10s. Photo below shows a grid I use to identify the daily activities for my 12 high school Consumer Math students (all with IEPs) in an 86 minute block. Our daily agenda is comprised of a warm up puzzle (to get them settled and to allow me to coordinate with the other adults – between 2 and 4) and two rounds of activities. Each column is used for a student. The “C” indicates computer use (we use IXL Math mostly and have 4 computers in the room) and the colors indicate the adult supervising. Each student has a manilla folder which contains all handouts needed, including the daily puzzle, and the IXL modules to complete taped to the inside front cover. In a given day we may have different students counting nickels and pennies, identifying coins, identifying bills needed to pay a given price, computing sales tax and total price and creating a monthly budget on Power Point, with photos. The system allows me to track the many details. 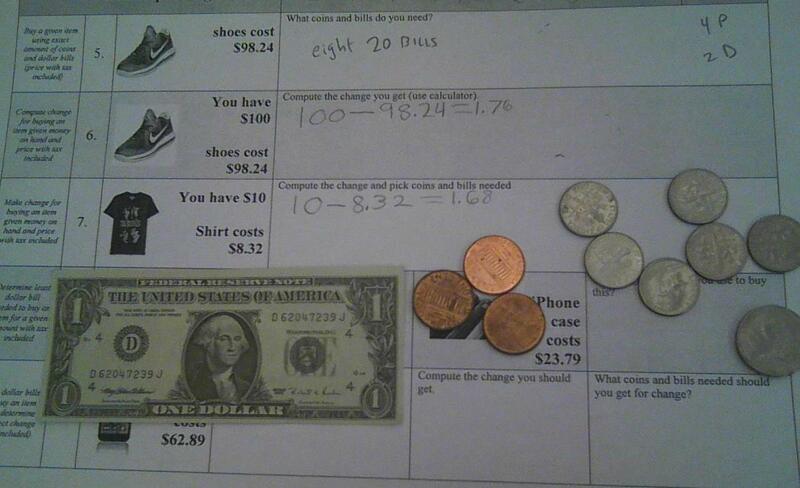 The following shows steps to introducing the concept of the value of money and of adding coins. The concept of a dime is presented as 10 pennies (see below). 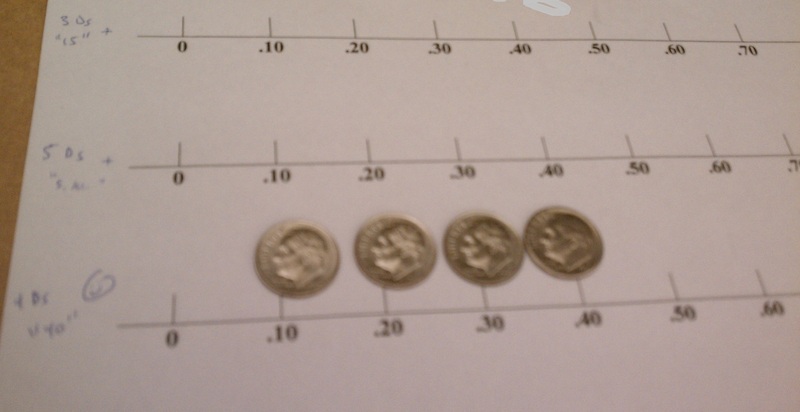 The dime is compared to a penny, nickel and quarter using these representations. Repeated use of these representations leads into an intuitive understanding of the coins. 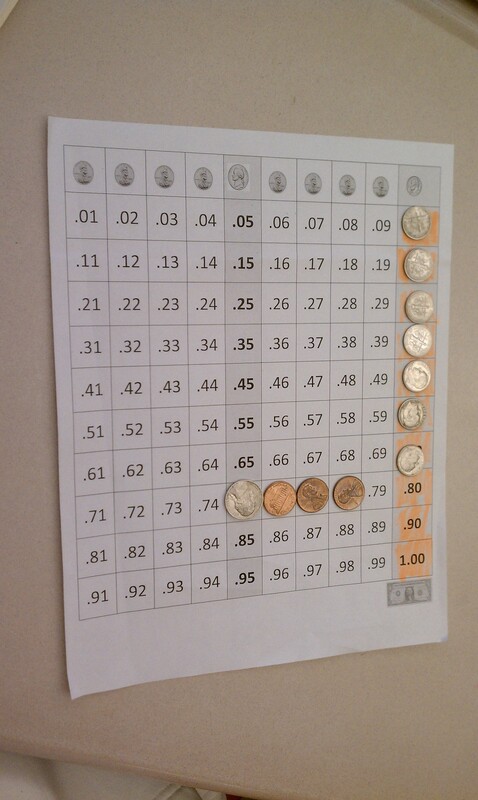 Next is determining the value of multiple coins. 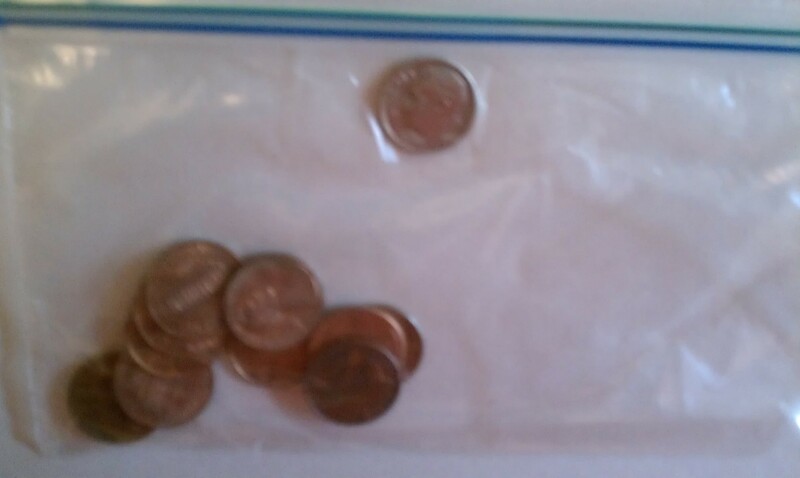 The place to start is with pennies, which is relatively easy as the number of pennies represents the value. The next step is to count dimes because counting by 10s is relatively easier than counting by 5s or 25s. Dr. Russell Gersten is a guru in special ed. At a presentation at the 2013 national Council for Exceptional Children he explained that number sense is best developed using the number line. With this in mind I created a CRA approach using the number line. First, the student lines up the dimes on the number line (see photo below) then skip counts to determine the cardinal value, which is the value of the coins. Upon demonstrating mastery of counting dimes, the student moves from using coins (concrete) to a representation – see photo below. This approach is used for nickels and then a combination of nickels and dimes (corresponding blog post forthcoming).